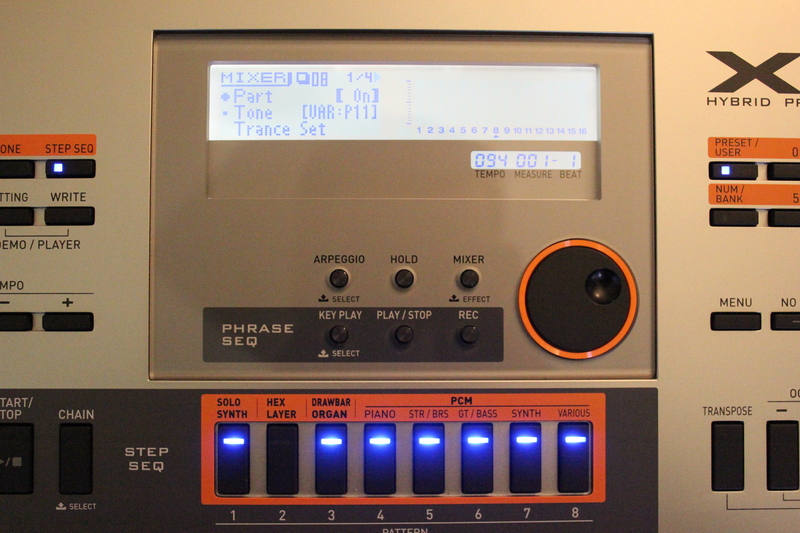 So you’ve bought a new XW-P1 and you’re ready to put down some parts in the step sequencer. You dial in a blank or untitled step sequence and begin but you don’t have the kick or snare part that you want. Don’t worry, changing tones is easy. Your first instinct may have been to press the TONE button, but that only allows you to change the sound that is live on the keyboard. The answer lies in the mixer. Press the mixer button and it will take you to the MIDI channel that corresponds to the part you’re working on the step sequencer. Use the cursor button and select TONE on the screen then use the +/- (yes/no) buttons or the data wheel to dial in the sound you want. Scroll down further using the cursor keys and you’ll find the volume, pan and effects settings for this part. You even can use the Part +/- buttons to switch between different parts. Don’t get confused by the names “Solo1 and Solo2”, they simply mean that these are monophonic tracks that can only play or trigger one note at at time. The Solo1 track can be used to play a “Solo Synth” tone instead of one of the regular PCM tones. We’ll teach you that trick in an upcoming post. This entry was posted on April 2, 2012 by MikeMartin. It was filed under Step Sequencer, Step Sequencer, XW Synths, XW-G1, XW-P1 and was tagged with mixer, Sequencer, XW-G1, XW-P1.